Long ago when Dr. Wily stole Mega Man’s blueprint from Dr. Light, a prototype was built. However, with the development of Zero moving forward, this prototype was discarded and forgotten. During the formation of the X-Hunters, the robot was discovered and completed by a mysterious man. Unlike the original blueprint, it was given much higher specs than that of Mega Man X, using state-of-the-art technology. This concept came from the episode listed in MEGA MAN X OFFICIAL COMPLETE WORKS – There were originally four characters in the X-Hunters, however, one character had to be cut out due to ROM capacity. 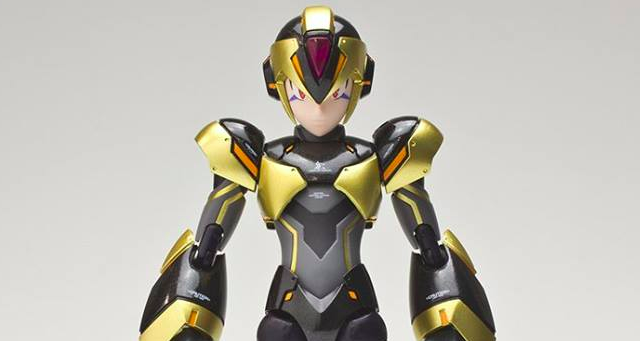 It still amazes me that CAPCOM did not bring out a villain that looks exactly like Mega Man X. His armor crest has also been switched to Sigma. You know, TruForce could have just as easily sold this is a variant with no exposition at all. Instead, X-Kai actually has more of a backstory than other canonical X series characters.It really shows how invested in the brand their working with. If you'd like to learn more about how X-Kai fits into the big picture, check out #20's in-depth analysis here. It's pretty great! Are you freakin' kidding me? It's a cheap recolor! And that backstory? Shameless fanboy lore fulfillment. ...well, maybe that's being too harsh. Your criticism is almost as good as the development of Mighty Number 9. These guys are model makers, not writers, yet they still went the extra mile and gave their variant model a backstory anyway. But yeah, I'm sure it's just "shameless fanboy lore fulfilment". People like you are what give fandoms bad names. iX build by Wily and rebuild by... Wily? Isoc? Serges? A virus? Who cares? Not me. Probably Serges, although if that were the case, why wouldn't they just say so? 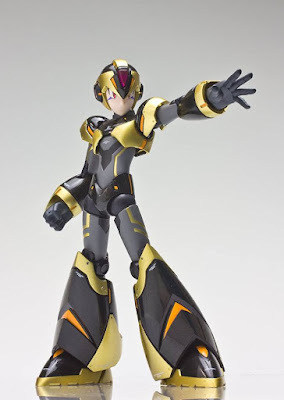 *pfft...* You want the real back story, Capcom created the artwork/concept as a April's fools joke, pissed off fans, later Truforce decided take the concept to make a figure of it, Truforce made a kickstarter, got funded by backers and backers input, figure created, later Truforce decided to go behind backers back and create another figure as a exclusive to prompt themselves without any word of the actually backers who basically funded Truforce, was going to sell it to con attendees only forgetting the actual backers who without them the figure would not exist, backers complained, backers were given a chance themselves to get the exclusive, and finally backers will get the exclusive figure with the regular blue figure later on. Truforce promised that backers will be the first to get the regular blue version before other retailers do and yet they retailed it themselves at the con and many attendees walked away with both figures, pretty much f'ing the backers. That's the real back story of this! i still feel violated that i and many others got the shaft. "Everyone else"? Only people that went to Comic Con got figures, and the backers are getting them before any retailers are. That still makes no sense as basically TruForce "retailed" it themselves, with them knowing that their own backers should of gotten it first as promised. I'm cool with the character. Is it a little generic for the backstory, yes, but that's not exactly unheard of in the Megaman franchise. It reminds me a bit of that concept the Mechanical Maniacs had of a hero Sigma and villain X. The original setup of the fourth character in X-Hunter (Counter Hunter) is a woman, as I remember. A female makes more sense than a woman, at least then we are not talking about humans exclusively. You are right. I should write "female." I've said it before and I'll say it again. I've never seen a fan base as ravenous and irrational as the Megaman fan base. Can't really blame them, Capcom (of Japan) has been doing a poor job with the series lately. Many are still (It's Guts Man! *dun dun*) hurt about the cancellations of Mega Man Legends 3, Mega Man Universe and Rockman Online. And unresolved cliffhangers (MML2 and ZXA). And Rockman Xover. And with the comic going in hiatus, there isn't much new to look forward. But it would be good if most got better. While not what we wanted, at least we have Sumer Mario Maker (MM Universe) and reD ASH (MM Legends 3). At this point I look to it as nostalgia fun. Toys and things that remind me of when I had fun playing it as a kid. I stopped expecting Megaman games long ago and was surprised as hell when 9 and 10 came out. But this Truforce thing really helped escalate things for most people. I was a backer and I was bummed about the OG version getting sold at NYCC, The whole Exclusive thing didnt bother me in the slightest other than the fact it delayed the backers from getting there product. But at a business standpoint what they did (if sales were decent) would help them catapult their business with enough exposure to get MORE demand thus creating more figures down the line without the aid of Kickstarter. That's what Kickstarter is about, getting businesses and ideas of the ground. Not picking one project to the next completely dependent on fan demand. As great of an idea as that sounds, It's not lucrative in the slightest. Yes, TFC could stand to improve their communication, but people need to realize they are likely people that have NEVER done anything like this before and have one or possible 2 other jobs outside of trying to get a new toy line off the ground. "...but people need to realize they are likely people that have NEVER done anything like this before..."
I get what you're saying, but this sort of thing is relatively new to EVERYONE still. Some people are just going to default to being extremely defensive / suspect since they are putting money down on faith, regardless of the circumstances the company making the product is in. It will be interesting to see how things come along in the years. Hopefully there will be more good examples coming from Kickstarter over time that can make people more confident in the process, or at the very least understand when they should jump in or not. "...I get what you're saying, but this sort of thing is relatively new to EVERYONE still. Some people are just going to default to being extremely defensive / suspect since they are putting money down on faith..."
And this unfortunately going to be the case for a while until TFC can get enough startup to continue making figures without the aid of Kickstarter. Then it's just the matter of putting cash down for preorders. But they cant do that without taking risks and getting out to the public (NYCC fiasco) It's a Catch 22 for them. Rely on people to make a product that pays only for itself or upset the fan base by having a business plan. They took a risk, I hope it pays off for them. So far so good I'd say. The figures did get funded after all. That's more than can be said for a good number of kickstarters right there. So long as they conduct themselves appropriately in the future, I imagine things will work out. Fun backstory for a non canon character with a sweet color scheme. I like it. It really is Bass X! I really want to make a romhack of X2 incorporating all these dank memes. Best one is by sculptor, MadHands, no doubts about it!!!!!!!!! Ouch dude, Tell me how you really feel. The only thing that missing from his head is a pair of fins. If only they make a transformable Support Unit, something like "Velguarder Adapter" so that he can wear it as his body armor... nyohoho! Yeah, that supposed story about X-Kai as a fourth member of X-Hunters is not so convincing. But, what makes me intrigued is, why have the colors and eyelashes just like Bass?